Insadong is a popular neighborhood in Seoul. I didn't know anything about it beforehand, but Jieun sold me on the idea when she mentioned traditional tea houses. Her Dad's friend also recommended this restaurant with an unusual name. 어머니가 구워주신 생선구이 translates into something like "Fish grilled by Mom." How charming. I always love it when banchan is in pretty plates. Not only does it make them more appetizing, the photos usually turn out better too. And that's just as important, right? This dish is 고등어 조림 (Godeungeo Jorim). It's basically braised mackerel. Here is the fish grilled by Mom. It's called 갈치구이 (Galchi Gui), just like in the restaurant name. This soup was downright tasteless, but oh so pretty in its bowl. It's probably the only thing I ate in Korea that I did not enjoy at all. Overall, dinner was enjoyable. Afterward, we immediately set off to find that tea house I mentioned earlier. Right around the corner was this quaint little storefront. I ordered a refreshing cup of 모과차 (Mogwacha). It's a traditional Korean tea made using Chinese Quince. At the time, I thought it was papaya. Either way, it was delicious. 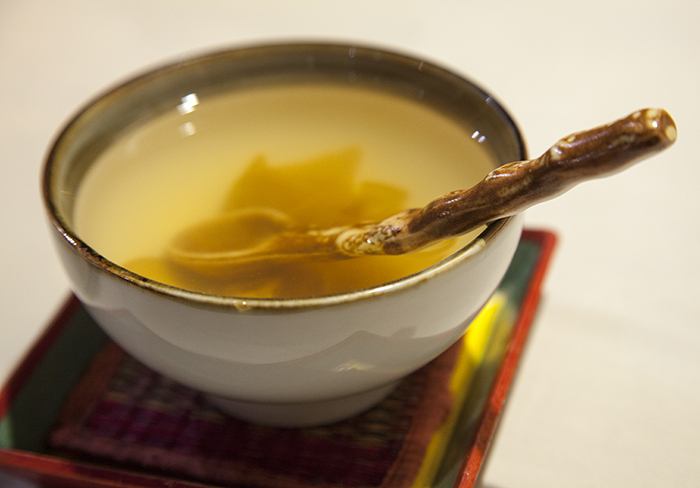 Jieun had the 국화차 (Gukhwa cha), otherwise known as chrysanthemum tea. From my seat, I had an interesting vantage point on one of Seoul's uber-modern buildings. If there's one thing I rarely photographed on this trip, it's the modern architecture scattered around the capital. Next time perhaps. After tea, we walked back down Insadong-gil and saw some other traditional Korean tea spots. We were soon distracted by these loud and crazy men. People seem to view Insadong as fairly touristy and these guys are a great example. It's very entertaining to watch them stretch a single piece of dough into 2 strands. And then 4. Then 8. 16. 32. 64. 128. 256. 512. 1024. 2048. 4096. 8192. 16384. 32768. 65536. It's like a computer scientist's dream. Yes, they really do go up to 65536 (and possibly higher). They then wrap these insanely fine dough strands around some chocolate, peanut, or almond filling. I like to compare the look and feel to horse hair. It's impressive considering it was made by hand. I had a habit of reading the various Hangul signs I saw as we walked around. This one says "Pa-pa-i-seu" and I got all excited when I deciphered it and figured out it says Popeye's! And then I realized that I could have just read the English sign. Fast forward to the penultimate day of our trip. I decided to revisit Insadong to purchase more "horse hair" candy to bring back with me. I came across this man writing some calligraphy for the crowd that had gathered around him. Finally, I saw these two pounding away at some dough in spectacular fashion. Always something interesting to see along Insadong-gil.